KoopaTV: Harry Potter? Nah. Zelda on Netflix? ...Maybe? By LUDWIG VON KOOPA - Rumours of Nintendo and pop culture. I am notoriously bad at pop culture, whether it be anime or watching real movies. But this apparently requires some kind of commentary, so let's go! 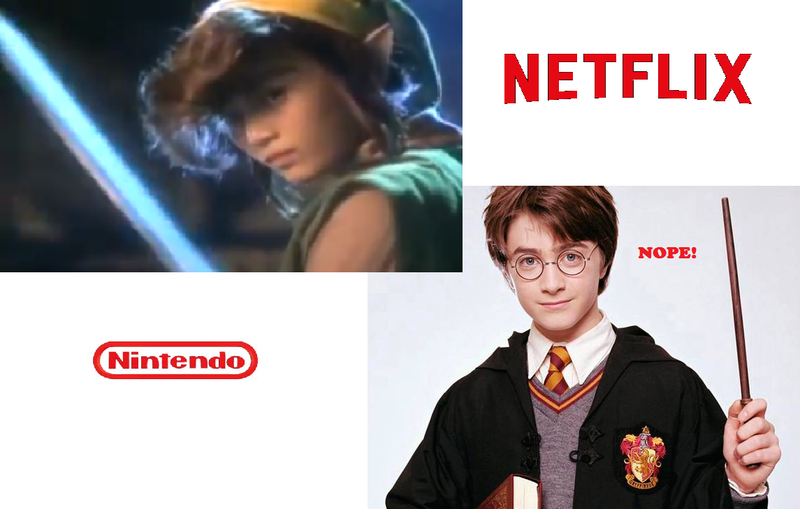 Over the past few days, Unseen64 has revealed that Nintendo tried to buy an exclusive Harry Potter videogame license deal back in the late 1990s. The Wall Street Journal has revealed that Netflix is in the very early stages of a live-action The Legend of Zelda series. Note that both these stories come from anonymous sources. "We don't need you, geeky Wizzrobe! We got our own IP!" Let's start with the first of those. Back in 1998 (the first book was written in 1997 and its first movie was 2001), according to Unseen64, the license for producing Harry Potter stuff in all media forms (not just videogames, but also movies, television, comics, whatever) was up for bidding from book series author, J.K. Rowling. Apparently, Nintendo and a bunch of movie companies (including eventual winner Warner Brothers) bid for it. Nintendo had Nintendo Software Technology immediately start working on the pitch, which might have doomed them from the start. J.K. Rowling must have thought Nintendo was wasting their time, since Nintendo's only line of media (at the time) was videogames. The other bidders could do every other medium, and that meant a lot more royalties for J.K. Rowling. Warner Brothers won, and sub-licensed the videogame production to Electronic Arts. Thanks to that, we got... this? Well, let's move straight into the Netflix discussion. Netflix apparently (though they and Nintendo both refuse to comment) is adding a Zelda-based live-action show to its line up of original programming, hoping to add it to the top part of this Wikipedia page. (It's already at the bottom under "Upcoming"!) Apparently it will be a friendlier Game of Thrones type thing. "Well, hey, Game of Thrones is super popular, and Zelda is super popular, SO LET'S STICK 'EM TOGETHER AND WE'LL MAKE MILLIONS! C'mon Nintendo, what do you say?!" I voted the 4th option, personally. Most people are cautious or worried in some way. Those don't sound like very positive words, you know. I think everyone liked, say, the animated Super Mario Bros. Super Show cartoon over the live-action Super Mario Bros. movie. I'm included in those, since I like all the times I used screenshots (those links are by no means exhaustive) from those animated cartoons than the one time I had a picture of something from the movie. And if you don't have a Netflix account... well, guess you better get one, you dedicated fan, you. Assuming this is a legitimate thing. And won't be canceled. And there are many reasons why it could be. Hey, maybe Miyamoto himself will work on this and stop ruining our games! Have fun with a serial television show with no characters or story! You know what'd be fun? You can watch Netflix not only on your Wii U, but also your Xbox One and PlayStation 4. So what if you watched the Zelda series on your Microsoft or Sony console? Nintendo can't stop that from happening! It's hopefully the closest thing you guys will get to Nintendo being a third-party. Nintendo only had a marginally higher chance of acquiring the Harry Potter license than KoopaTV would have, if KoopaTV existed back then. Imagine what KoopaTV would do with that license now... The possibilities are endless! For KoopaTV's take on that Harry Potter: Goblet of Fire dance minigame, click here. Just because the Super Mario Bros. movie was reviled by everyone, doesn't mean any movies afterwards are bad. The Wall Street Journal's Netflix report didn't come true, but now they have a new report about a Mario movie!